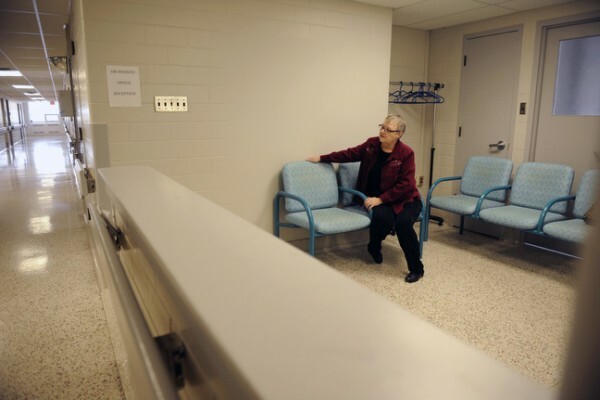 Silence and emptiness in the WCA Wing at Belleville General Hospital hints at the age and legacy of the only remaining part of the original hospital. The WCA Wing, which stands for Women’s Christian Association Wing, officially opened in 1886. Before that there was no hospital between Toronto and Kingston. Being a small hospital it started off with only three nurses and eight beds. In 1963, a joint ownership of the hospital was set up between the City of Belleville and the County of Hastings. This led to a whole new hospital constructed at the present site. The WCA Wing was once a hallway full of patients, nurses and doctors. Judy Woodley, a retired nurse, fondly remembers the years of laborious time she spent in this wing. Despite having recently been diagnosed with dementia, in February, her memories working as a nurse are still vibrant. Woodley met her husband, Gary, at the hospital. In 1966, Gary, along with his parents, were admitted to the hospital after being hit by a drunk driver. Gary was bedridden for five months. Woodley was assigned to be his nurse after surgery. The room where they first met is now an administrative office for Dr. Sean McIlreath, a general surgeon at the hospital. Where once patients used to lay now serves as a waiting area. The floors are speckled with grey and beige while the walls are painted with a gloomy grey. Where once chatter from nurses and doctors could be heard, the whir of fans and the buzz of florescent lights now fill up the space. Woodley remembers the WCA wing being full of life. “The head nurse would be all the way at the end of the hall and yelling at us to do things. It was kind of scary, but it was fun. So many people were here,” she says. The old nurses’ station, where patient information was gathered while socializing, is now a row of green plastic chairs laid out for people to sit and wait. Still, Woodley is reminded of the past by small things such as the white, cement-block walls and the coolness in the air. The early onset of dementia has caused Woodley to struggle with recalling new memories but a visit to the hospital brings nostalgia because the rooms, hallways, elevators and even the closets hold many memories for her and reminders of past experiences. Woodley stands at the end of the hallway where a big window is cut out, she feels like she’s on the job again, “I’m a mother. I’m a nurturer. I always have been a nurturer. Maybe that’s why I was a nurse,” Woodley says. Even after retirement, she is still the main caregiver in her family. The Belleville General Hospital, specifically the WCA Wing, is a place Woodley will hold on to for as long as her brain will allow. As the only part left of the original hospital, this place speaks volumes to Woodley’s own struggle with memory. “I can see everyone from back then. I can feel them here. I remember the people and their voices,” she says. This entry was posted in About, Multimedia and tagged 2014, Alzheimer's, Belleville, Belleville General Hospital, Dementia, Guillaume Nolet, Hannah Yoon, Hastings County, Hospital, Judy Woodley, Justin Chin, Loyalist College, Ontario, Sarah Taylor, Solana Cain, The Caregiver, WCA Wing. Bookmark the permalink.